I’ve grown up with an average fascination for beat-’em-ups. My fascination only went as far the amount of games I’ve played, and unfortunately it never hit double-digits. But my knowledge of the genre is certainly larger than my actual playing of it. Edelweiss, the guys who made Ether Vapor, would dip their toes into this brawler genre, and with it take some inspiration from games like Smash Bros., Tales of, and Odin Sphere. 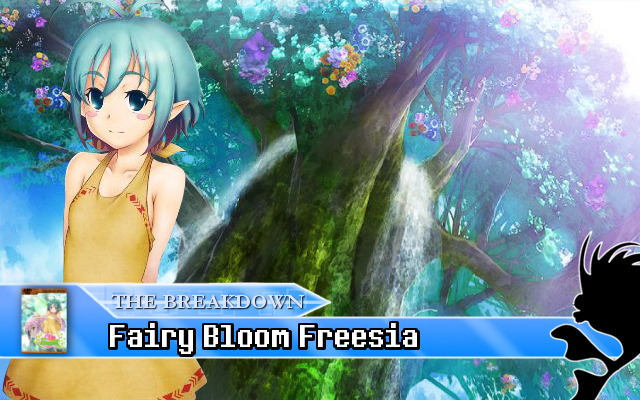 The game: Fairy Bloom Freesia. Does fighting as a fairy sound like an awesome idea? Or is she better off hiding in a tree? Hit the jump to see how this game fares. This entry was posted in Review and tagged doujin game, edelweiss, Fairy Bloom Freesia, Fairy Bloom Freesia review, Freesia, Indie game, japanese indie game, Listine, nyu media, Plum, Shynie on November 30, 2012 by Steven T..